MediMatic offers a vendor neutral cardiology workflow solution for your cardiology department, providing a fully automated digital workflow. Through a bi-directional integration with the HIS/EMR system, ComPACS facilitates worklist distribution, archiving, image review, advanced analysis and reporting, enabling clinical reports to be automatically available in the hospital’s electronic patient record. Integration with the Hospital Order Entry system will provide Modality Worklist distribution to the nuclear imaging device, allowing the operator to easily set up and start the case. After the imaging procedure, the study is immediately available in ComPACS for the physician to review, analyze and report. Generic measurements are available for all imaging modalities, including Nuclear, utilizing the calibration information already stored in the DICOM image object. ComPACS open architecture allows a seamless integration of third party analysis modules - such as “Corridor4DM” (INVIA Medical Imaging Solutions) - for advanced quantification, review, & reporting of cardiac perfusion and function. 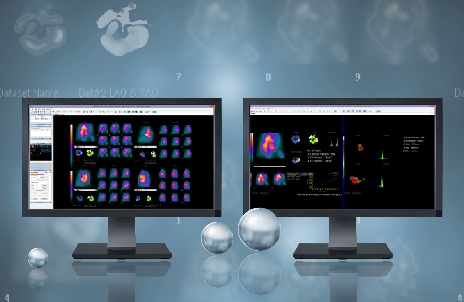 Nuclear cardiology reports can be customized to meet the specific workflow needs of your lab, with customized structured findings, allowing the physician to simply click on anatomic tabs, and then selecting the desired function and/or pathology check boxes to complete the narrative content of a nuclear report quickly and easily. Streamlines workflow by enabling physicians to view, complete and sign nuclear cardiology reports from the hospital, office or home. Using the structured reporting tool enables confirmed and electronically signed reports to be automatically routed directly to the HIS/EMR, making the report generated in ComPACS directly available in the electronic patient journal as a document.